Huntington Beach State Park features surf fishing, skating, surfing and it also features a bicycle trail. Its a large park with a cute cafe and a big duck pond. There are fire pits to enjoy bonfires at night or take a nighttime stroll near the waves and the smell of the bonfires is awesome. The Huntington Beach Pier is mostly used for scenic views, strolls and to catch a bite to eat at Ruby's Diner located at the end of the pier. 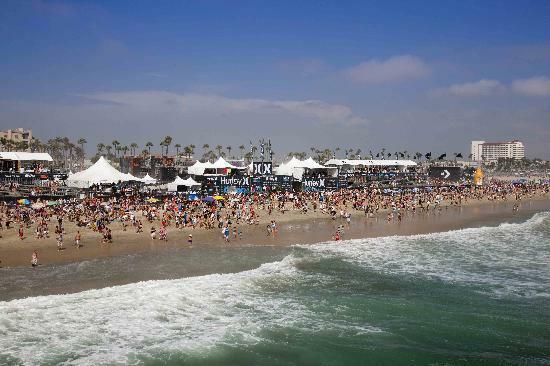 Every summer, the U.S. Open of Surfing is held on the south side of the pier, hosted by Vans. It typically lasts one week and is the largest surfing competition in the world. Looking for something to do on the Fourth of July? Head to the pier for parades and fireworks! Dog Beach is one of the few dog beaches in southern California and is also home to the annual dog-surfing competitions held every fall. The dogs actually put life jackets on! After some time at the beach you can take your furry companion to the dog park at Huntington Central Park. Its huge and cedar-chipped for them to run around off leash and socialize with other dogs and people. Bolsa Chica Ecological Reserve where you can take a guided tour or walk at your own pace. This is a sensitive nature reserve, not a park so please don't bring your dogs here. This is a place where you can take a relaxing nature walk or jog, try to spot a stingray in the bay, watch the pelicans dive for fish or spend some time to think alone. There are porta-potties in the parking lot but I've heard they aren't the greatest. Downtown Huntington Beach is fun and alive with a mix of bars, surf shops and many of the restaurants have outdoor patios that line Main. There are plenty of restaurants to choose from. The over all scene is casual and you get the feeling you've come to "the place to be" in the area. There are a bunch of people and as the sun sets, it increases. There are always fun things going on here! Bolsa Chica State Beach is big enough for everyone and great for boogie boarding. In the summer, you'll find the parking lots filled with RVs. This is a really nice beach to bring the family, an umbrella, a picnic and some beach toys and just enjoy a day at the beach. There are some fast-food joints, some public restrooms and places to wash the sand off. Take a Sunset Gondola. Ride through the canals and under the bridges on a lovely moonlit night. Their kiosk is located in the Peter's Landing Marina at 16370 Pacific Coast Highway. They are very attractive and unique with carvings and decorations bringing to life the old rowing tradition of Venice. The Gondolas are handmade at Squero San Travaso, the oldest boat yard in Venice, Italy. They offer group rates and various packages. For more info, go to sunsetgondola.com. For shopping, check out Bella Terra, tons of stores and restaurants. Located at 7777 Edinger Ave. in Huntington Beach California.